Review: Unpopular opinion alert! I am a huge fan of the writing due of Christina Lauren but this was a disappointment. Perhaps my expectations are too high. The Beautiful series is such a perfect mix of love, romance, sexiness and laughter that when I go into one of their books, I expect to fall in love with the characters and laugh. This book wasn't bad, it was just okay. Told in alternating timelines, we follow Macy, a pediatric resident in San Fran who is living with her fiance. Life is going along when she runs into her teenager love, Elliot. They haven't seen each other in years and all the feelings start coming back. But why haven't they spoken in so long? In another timeline, we follow teenager Macy and Elliot as they meet up on weekends and become friends, best friends and then boyfriend/girlfriend. Half of the book was Macy and Elliot as teens and they spent most of their time reading next to each other in a closet. I'm a huge reader myself so there is nothing wrong with this, their relationship just wasn't that exciting or passionate. When we finally get to the big reveal of what happened (I would have been furious too), I felt like nothing was addressed but I honestly wasn't invested in them as a couple to care that much. 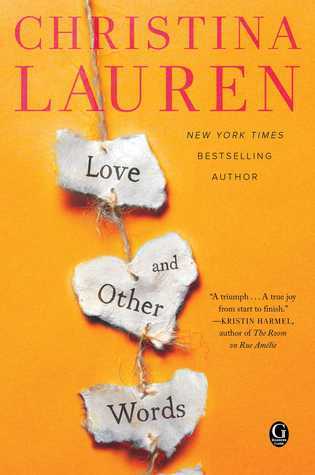 Not my favorite Christina Lauren book but I'll continue to read them.